Yes, I’ve already missed my self-imposed goal of posting these on Mondays but The Walking Dead Season Finale trumped writing the blog yesterday. It’s worked out for the best anyway, you’re getting something more than a few word count metrics. 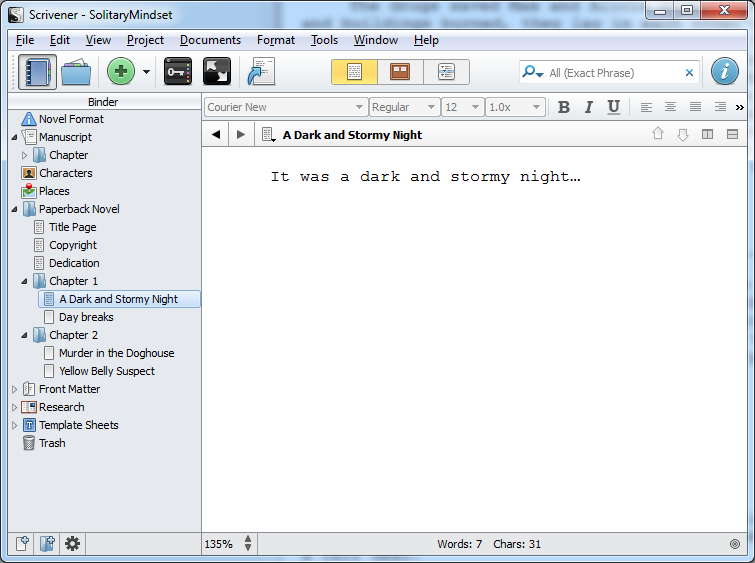 I’m going to talk a little bit about the writing tool I use for my fiction – Scrivener. For those of you who haven’t heard of it before, Scrivener is a custom word processor designed for writers of all types. There’s a couple of big differences between Scrivener and something like Microsoft Word. First up, it organises your project into folders, sub-folders and files, like you would on a hard drive. At the most basic level, you might have something like a manuscript folder with one sub-folder for each chapter beneath that and then one text file for each scene in each chapter. That nested structure makes it very easy to jump around. Rather than having to remember page numbers or scroll endlessly through a single 300 page document, you can just jump to the right chapter or scene. You can also move pieces around very quickly, something that can be very handy if your book has multiple plot threads. Scrivener also provides various outline, colouring and corkboard views to make working with big project even easier. The second feature that makes Scrivener different from “normal” word processors is that you can also store images and other non-text files in your project. So, you can store reference information, photographs of locations, “casting” photos of your characters etc. in a single location so that it’s all readily available as you’re working on your project. Very useful. There’s a lot of other very handy features as well. I’ve been using Scrivener for quite a while now and I’ve really only scratched the surface. If you’re someone who works with documents a lot, it might be worth a look. So, what about my Apocalypse Weird novel, Siren’s Call (working title)? When I’m working on a novel, I have a rough idea of where the chapter breaks are but I don’t actually work in chapters until I’ve written the first draft. So, my Scrivener project for Siren’s Call has a single folder – Story – and then 62 text files which correspond, roughly to individual scenes. Roughly. The scenes have names like “Rag and Bone Men” or “Octopus Time”. That won’t the name of the chapters (although I am fond of Octopus Time), those titles are just there to remind me what happens in that scene. Currently, I’m working on the 33rd scene and I’m sitting at 30,808 words. The exact number of scenes in the novel will ebb and flow as the story develops, and the scene lengths vary dramatically, so you can’t read to much into that but it’s a fairly good sign that I’m on track to be within the word count limit for the book – 55-75,000 words. 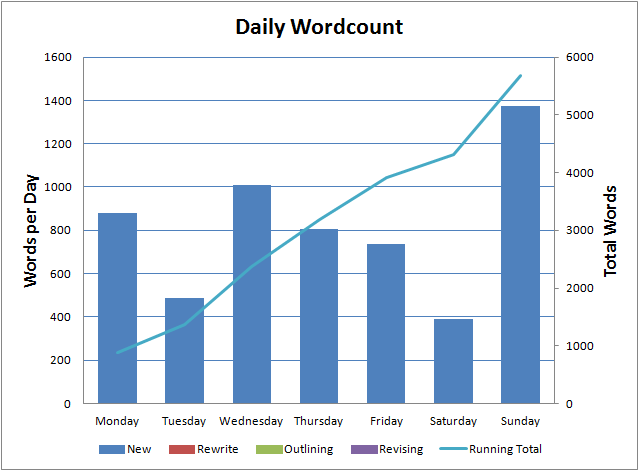 I don’t have final deadlines for the novel yet, but I’ve set myself a goal of at least 5,000 words a week on the first draft which means it should be done by the beginning of June at the latest. So far I’m loving writing this and it’s going very well. That’s a total of 5,681 words so right on track. Saturday was a bit unproductive, I usually crank out the words at the weekend, but life got in the way. Sunday made up for it though. Siren’s Call was the only project I worked on and apart from a little bit of editing I need to do on a new short story, that will probably be the case until this first draft is complete. All in all, the book’s off to a good start. Hopefully I can keep this up for the next nine weeks. Time will tell.